Revolution give safety lessons before you use their electricity powered karts. 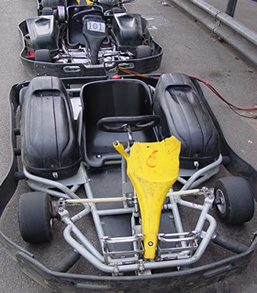 They will help you to choose a kart that suits you best so you can use it well. The track is floodlit in the evening. There are always staff to help you. Sometimes they use their track for wheelchair racing too! There is a room with lots of comfy sofas. If you need a chair with arms the staff would be able to help. There are amusement machines and you can buy drinks and snacks. It's a good idea to book tickets before you go if you want to visit as a group. Arrive and drive costs £10.00 for 8 laps of the racing track. If you are under 18 years old you will need to be with an adult. Contact Revolutiion Karting for group prices. The race track is under the railway arches at the southern end of Mile End Park. There are places to park right outside Revolution. Phone to book a space and accessible parking. 277, 309, D6 and D7are the nearest mobility buses. 277 is also an accessible night bus. (District, Central and Hammersmith lines) Mile End Station is about 700 metres from Revolution Karting. Mile End Station is not accessible for a wheelchair user. Limehouse mainline station is about 1000 metres from Revolution Karting. The mainline station is not accessible for a wheelchair user. The main entrance is flat. All you need is provided on the Ground floor. There is room for a wheelchair to move around inside. The minimum door width inside is 875mm. There is a unisex accessible toilet, it is not locked. The door width is 930mm. There is a shower to use after your drive. The shower is not adapted for people with disabilities.